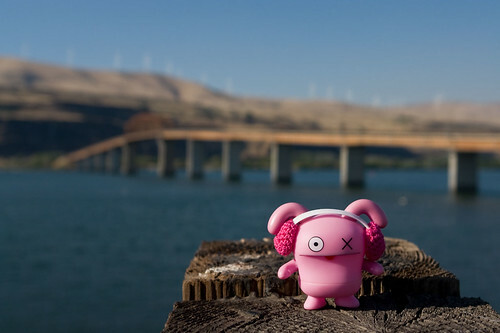 Uglyworld #723 - Ox at The Columbia River, originally uploaded by www.bazpics.com. Cinko wasn't the only one who was amazed by the sheer mass of wind turbines that line the hillsides of the Columbia River, so once we had crossed back over the bridge into Oregon Ox asked if he could have his picture taken with the columbia river, bridge and wind turbines all in the background to show everyone back in Aachen where he has been. As I was taking this shot Ox said, "Be quicks, there is bird poo's everywheres here and I don't fancies being involved in their next targets practice! ".